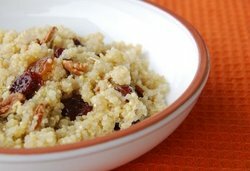 "Quinoa is a complete protein, which means that is has all nine amino acids, and can be prepared equally well as a savory or sweet dish." I'd heard of quinoa, but never had a reason to try it before I happened on Susan's recipe at her fabulous Food Blogga's site. I can't get enough of this stuff. I've already made 6 batches for breakfast & then made a savory version for dinner last night. If you've never tried it before here's why you should! This is an ancient Incan sacred crop, that the Inca's called "chisaya mama", or mother of all grains. But it's not really a grain. It's actually a seed. And it's even Kosher for Passover. Because it's high in protein, (7 grams per serving compared to 4 grams for brown rice), high in fiber, & is a good source of manganese, magnesium, iron, copper & phosphorus, the United Nations has classified it as a "super crop". It contains the amino acid lysine which is needed for tissue growth & repair. As if that isn't enough, it's gluten free and a breeze to cook. Trust me, 15 minutes on the stove is nothing. Don't let that stop you. You can use quinoa wherever you'd use rice or couscous. It's kind of risotto-like. My very "picky eater" sister was visiting last weekend & she rolled her eyes when she saw me mix up a batch on Monday morning. I knew better than to offer her a taste, but this stuff smells delicious, so she asked me for a taste. She literally took her spoon to the wastebasket, prepared to spit it out. But Voila, even she loved it. She said, "What is this stuff? Is it a dessert?" Believe me, it's that yummy. Kind of like a bread pudding. I don't know if this accounts for all it's nutritive value, but it's a relative of beets, chard, and spinach & we all know how good those are for us. I recommend you use Eden Organic Quinoa. They use a mechanical rubbing process to remove the protective saponin coating from the grain, rather than a water wash. This retains more flavor, fiber & nutrients. When I compared the nutrient values of Eden's with other brands, it had the highest in all categories. I found quinoa in my local grocery store, but it's also at Trader Joe's & any health food store. Here's my "less-work-less-pots-to-get-dirty" version of Susan's Breakfast Quinoa with Dried Cherries, Raisins, and Pecans. To print on one page click HERE! Return to a boil, and then cover, reduce heat & simmer for about 15 minutes, or until the quinoa absorbs the water, puffs up, & turns translucent. Add more water if needed. 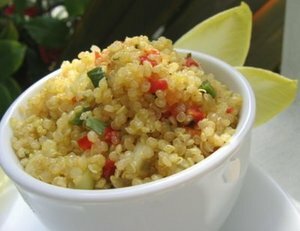 Quinoa retains a slight crunch when cooked. Makes 2 servings. I eat one, & save the rest for the next morning. It heats up beautifully in the microwave with a little soy milk to moisten it. Last night we feasted on more of Susan's recipes. You must check out her site. For dinner we started with her Seductive Strawberry Salad, and then her Inca Quinoa Salad. I cut the salad in half, since there were just the two of us, and I used the mesclun mix I had on hand instead of wild arugula & spinach. Definitely use the fresh mint, basil & blood oranges. I took the easy way out & instead of making the salad dressing, I had something similar in my fridge, called, Wild Thymes Meyer Lemon Salad Refresher. 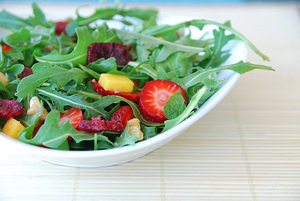 It's a healthy ingredient, 35 calorie dressing that is very similar to Susan's! Okay so I tried the savory quino recipe and it was great. Husband loved it however 15 year old daughter wouldn't try it. Epicurious has a lot of great recipes als foodnetwork.com. I found it in flour form so it would be interesting to use for passover. the store I purchased it had pasta made from it.